Flirty Flamingo and I are BFF's! I just love making Valentines's Day cards! I get to be just as girly and use as much pink, ribbon, and glitz as I want to! It's a fabulous feeling to not have to hold back. I have been dying to use this Buffalo Check Stamp with Flirty Flamingo ink on Flirty Flamingo Cardstock, and it is just as fabulous as I imagined it would be! 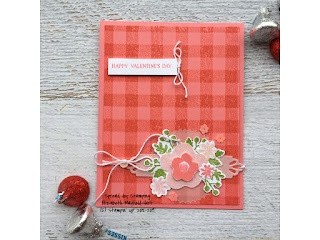 I used the Needle & Thread Stamp Set (148724) and stamped the large flower, the small flower and the trio of flowers in Flirty Flamingo, Blushing Bride, and Petal Pink (because I wasn't sure what colors of which flower I wanted to use where yet. I stamped the large leaf background stamp twice in Granny Apple Green. I cut everything out using the Needlepoint Elements Framelits Dies (148541). Additionally, I cut out the long tag shape out of Blushing Bride. I stamped the Happy Valentine's Day sentiment in Flirty Flamingo on Whisper White Cardstock (Forever Lovely Stamp Set, 148624) and cut it out with my snips. I layered the flowers, the tag, a starburst of vellum, some white twine, and a tiny pink button toward the bottom, and placed the sentiment toward the top. I even scattered a few of the Gingham Gala flower shaped sequins around! PS The Needle & Thread Bundle (The Needle & Thread Stamp Set plus the Needlepoint Elements Framelits Dies) are $45.75. Add on the Needlepoint Nook Mini Buttons for $7.00 and you have earned a Free Sale-a-Bration item! Head to my online store and check out the free goodies! I am an Independent Stampin' Up! demonstrator. I approach life with silliness, joy, sarcasm, and happiness. I do yoga and craft to stay sane! Who Makes These Amazing Stamps? Images © 2015-2019 Stampin’ Up! I am an independent Stampin' Up! demonstrator and my blog content is my sole responsibility; Stampin' Up! does not endorse my website or any of the silly things that I say!